* Have you entered my giveaway yet? It ends June 18th! 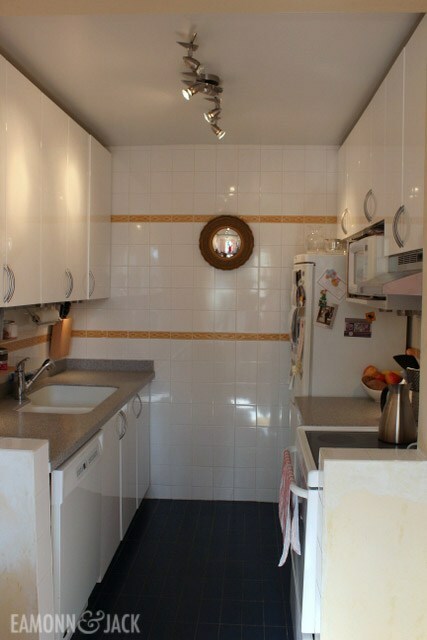 I haven’t shown my kitchen too much on my blog. The reasons for that are two-fold. It’s quite a small room (7'x7.5') and with most of the wall space covered with cabinets there isn’t much room for pretty things. 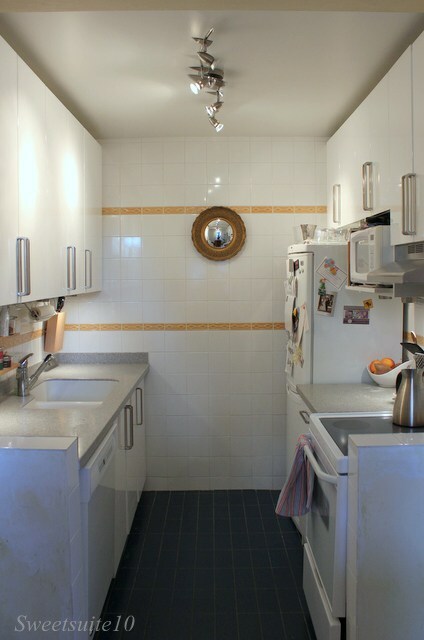 Don’t get me wrong, there are things I’d LOVE to change about my kitchen, but I’d need much deeper pockets. A previous owner put in the current cabinets (Ikea Abstrakt) which I rather like. A couple of things I don’t like are the tiles. The floor tiles are dark blue, and for some reason they tiled the back wall from floor to ceiling with white square tiles. That in itself wouldn’t be so bad except for the two bands of decorative tiles in Tuscan Yellow. I’d love to change the floor tile, and remove the wall tile, but with quotes for the work at close to $5,000 it’s not going to happen (at least any time soon). 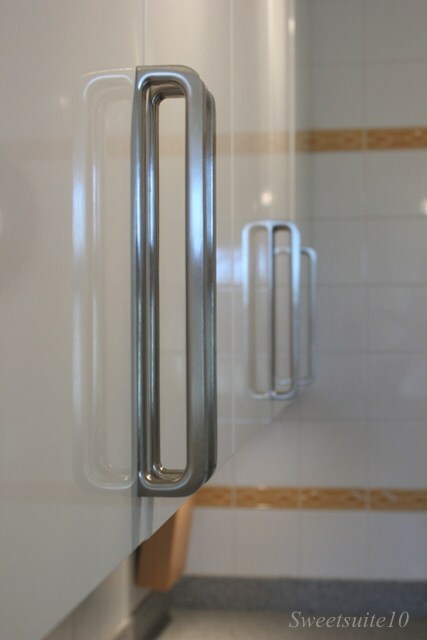 One of the smaller things in the kitchen that I could change are handles. When the kitchen was installed they used the Tag handles from Ikea. 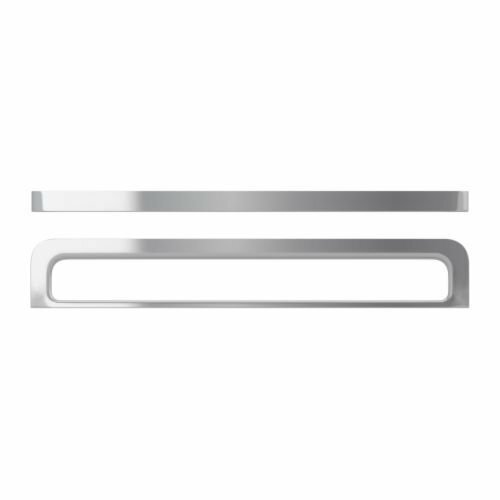 While the handles are okay, they aren’t especially exciting. For a while I thought it was just the handles themselves I wasn’t fond of, but I soon realised it was the size. The full-height upper cabinets are quite tall, and the 128mm (7”) handles looked a little puny in comparison. My existing Tag handles - see how small they seem? The problem was I couldn’t figure out how to install large handles given there were already holes drilled into the cabinet doors to install the small handles. A few weeks ago when my mom was visiting from out-of-town we made our routine pilgrimage to the big blue mecca of home décor (There isn’t an Ikea close to where my mom lives) and I spotted these Spann handles. 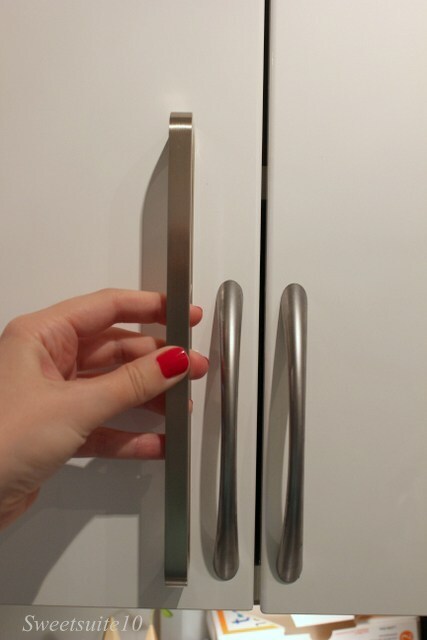 They solved my problems – they’re much larger than the handles I had, and with the metal bar at the interior of the handle they would very nicely cover the hole that was already drilled for the smaller handles. Another bonus? They were being discontinued so were half off ($6 a pair instead of $13)! My mom and I stood it the kitchen section at Ikea for a while mentally counting the number of handles I’d need, and then headed home with 9 packages. I have a little problem with buying things for projects and then not actually working on the project for weeks or months (cough, cough - my chairs). These handles only waited around for about 2 weeks until one evening when I was feeling adventuresome and I broke out my drill. I have to say that I was more than a little nervous to put additional holes in my cabinets, but I figured that if things went badly I could always just buy a new door as they're still available at Ikea. Luckily for me everything went relatively smoothly. Et voilà! My new handles in place. I think the new handles are a much better scale for the cabinets. What do you think? I love them! It's amazing how much impact the handles one chooses for the kitchen can have in changing the whole feel of it. These actually make a statement instead of just blending in as the others did. Love them, love them. 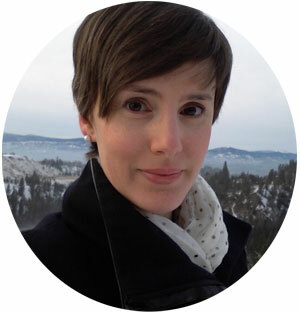 A wonderful change! 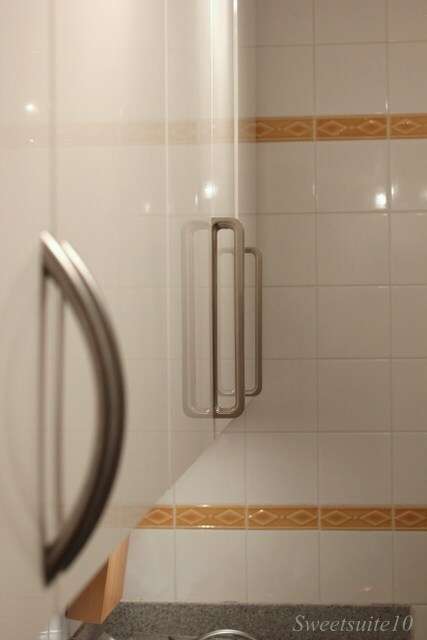 For an easy inexpensive solution the band of yellow tile, check out the recent post ove at Young House Love where they were able to retrofit a similar band of tile in their bath. If you removed the just the bands with the tile Dremmel tool and replaced with matching white tile, you would have fix that issue for minimal dollars. Yup - I've seen what Young house Love has done. I'm actually really thankful they did it - I've been considering doing it since Christmas (I got a Dremel Multi-Max) but have been more than a little terrified to try it. Now that I've seen it can be done, I'm a wee bit more willing to give it a shot. I'll have to figure out what type of tile to use though. . . . 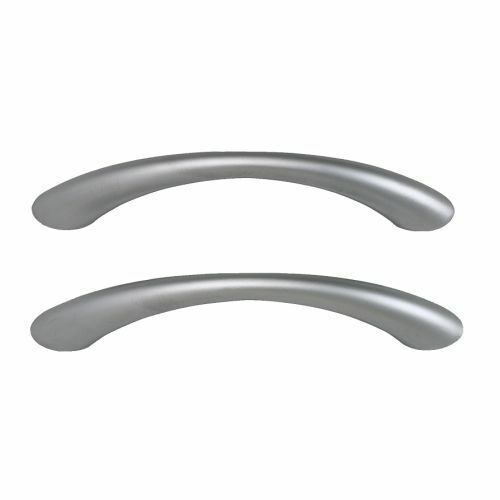 Your new handles definitely make a huge difference! 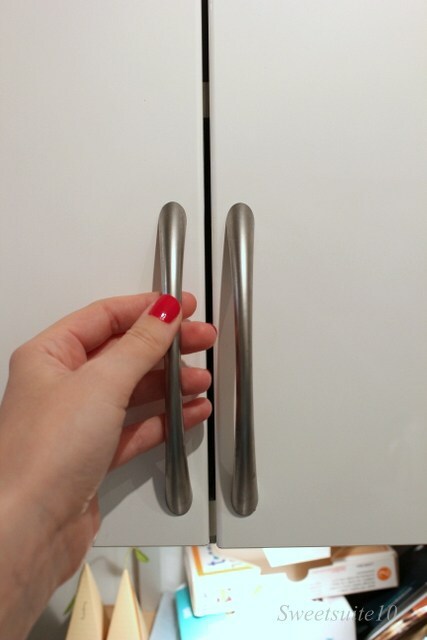 Wow, what a huge difference those handles make! Great call, they look fabulous! Kudos for doing it yourself. How about painting out your yellow tiles for a quick fix? And maybe a nice runner on the floor? You haven't got any spann handles spare have you? 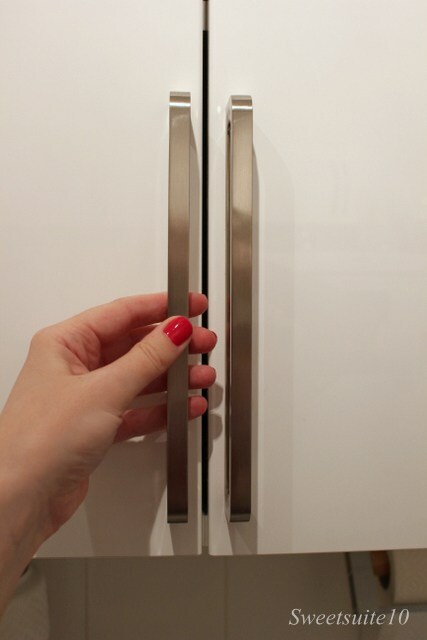 Just missed out and my kitchen is only half finished... Not enough handles :0 or did you buy just the right amount?